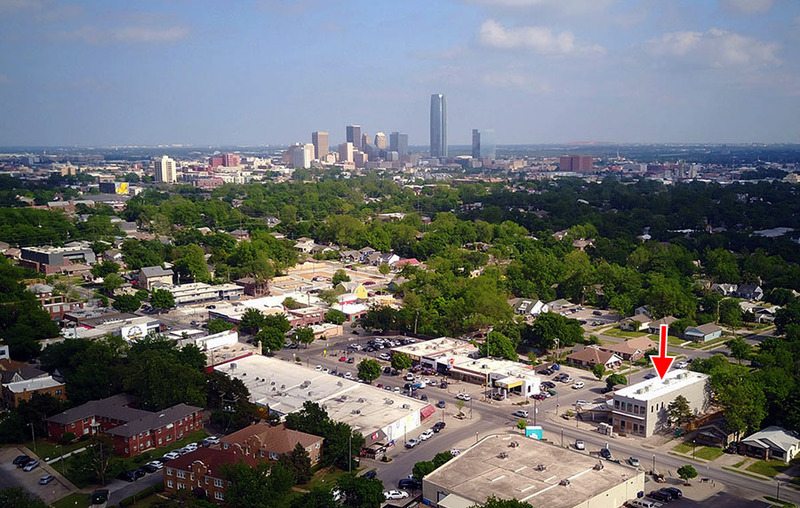 One of the Plaza District's first break-out successes is planning a move just down the street into new and bigger quarters. 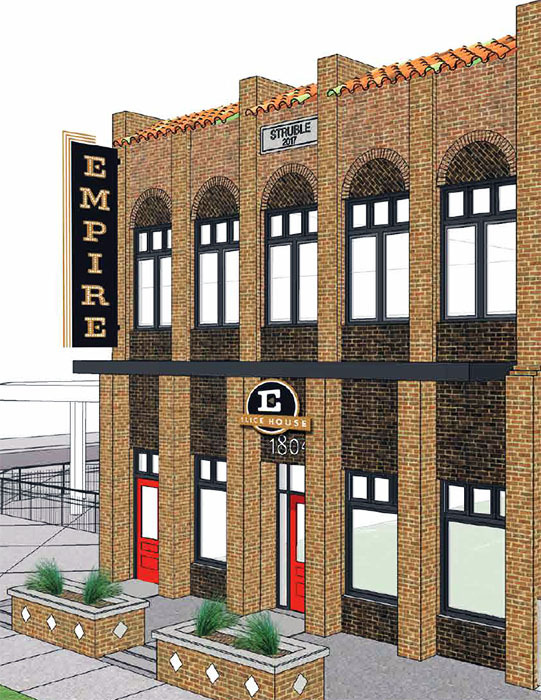 The new digs for Empire Slice House are currently under construction near the west end of the district at 1804 NW 16th, a two-story building where Empire will take the entire first floor plus a large patio area on the west side of the building. Empire's parent group, 84 Hospitality, will also take the entire 2nd floor as their corporate offices. The popular pizza place and hangout first opened in its current location in September 2013, but proprietor Rachel Cope told OKCTalk the polarity and volume had caused them to out-grow their current space which had been cobbled together over the years, including enclosing a patio in an attempt to keep up with ample demand. As a partial solution the group opened Easy E Slice Shop where they had more cooking facilities and an outlet for their popular carry-out orders. Easy E will remain as it has proven to be a success story of its own. Cope said there will be a high priority placed on maintaining the current Empire vibe, which has made the current location a local favorite. The existing posters, gold table tops and other items will make the move to the new space. But Cope said she knows much more now than she did 5 years ago when Empire took what had been an old laundromat and transformed it into a big draw for the burgeoning Plaza District. Now, the opportunity comes to design the new space from the ground-up where there will be much more space developed to prep and cooking. The amount of pizza ovens will double and in general there will be the ability to better and more quickly serve the Empire patrons. 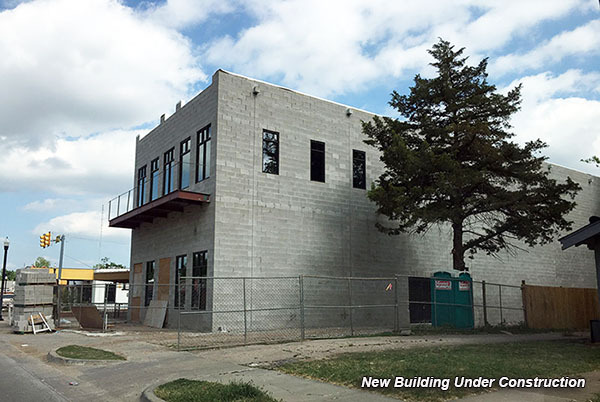 In keeping with their established formula for success, a large patio will located on the west side of the building shaded by a mature tree which developer Jeff Struble made sure to work around and preserve. The exterior west wall is also permitted as part of the Plaza Walls mural project with exact artwork yet to be determined. The final color of the brick for the completed building will be a light tan -- almost white -- which is different than shown in the first rendering. There will also be some other minor exterior changes. The bar area will also be significantly larger and will be featured along the west wall of the interior space. Ellie the pink elephant will make the move as well to be displayed at the entrance along NW 16th Street. If all goes to plan, there will be only a week down-time before the new opening this August. The new brick-and-mortar location for Maples Barbecue is currently under construction to the immediate east. 84 Hospitality Group also operates Goro Ramen, Revolucion and Ponyboy all in OKC's urban core.